In my late teens, my goal was to find the ultimate bop recordings. I was an obsessive “completist” of the works of Bird, Sonny Rollins, Bud Powell, Monk, Dizzy Gillespie, Fats Navarro, Dexter Gordon and of course Miles Davis. The harder and more complex the music was, the better. 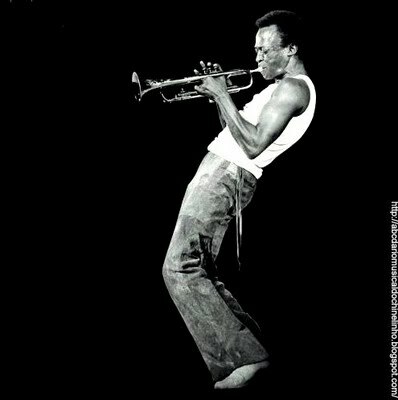 There are so many periods of sheer genius throughout the career of Miles Davis. I love just about all of them. His early recordings with Prestige feature some of the most original and groundbreaking bop ever recorded. Collectors Items always brings back the fondest memories of my childhood. I wore this record out several times and I still come back to it frequently at the age of 40. It’s the only recording featuring Sonny Rollins and Charlie Parker on tenor saxophones as well as Walter Bishop on piano, a young Philly Joe Jones on drums and Percy Heath on bass. These sessions were recorded for Prestige on January 30, 1953. Many critics stated that Miles’ chops were “shot” during this time but I disagree. This isn’t the polished Miles from ’56 on but there’s a brash rawness to his playing here. Miles also leaves most of the solo space open for Bird (nicknamed “Charlie Chan” on the session due to his contractual obligations to Verve records) and Sonny Rollins. “The Serpent’s Tooth” has a big band bop sound to it. Both takes are incredible. This is rough edged bop that isn’t overly produced or rehearsed. Every nuance conjures up images of the pimps, hustlers, and dope dealers that would pop into the after hours jam sessions at Minton’s Playhouse in New York. This music is New York City of the early ‘50s. All of the grit and demonic vices are present at all times. Bird can take you to that place instantly and mercilessly. He sounds incredible on tenor sax, playing mostly in the lower register. You still hear many of Bird’s revolutionary trademark licks but there’s a stark funkiness to his tenor tone that’s incomparable. And Sonny Rollins was already the greatest tenor player on the scene. He had already developed one of the most uniquely virtuoso styles in the entire history of jazz. Walter Bishop’s piano playing is hard and melodic and Percy Heath cooks on bass. There’s a sad desperation to this early Miles reading of Monk’s “’Round Midnight.” Miles cries in agony through his trumpet like a man dying in the gutter. Bird and Rollins dance beautifully around the complex chord changes. There’s a second session on the album from March 16, 1956 with Miles, Sonny Rollins, Paul Chambers, Tommy Flanagan, and Art Taylor that is understated and beautiful. “Wierd Blues” would soon be known as “Coltrane’s Blues” when Trane would record a version with Miles later that year. The version of Dave Brubeck’s “In Your Own Sweet Way” is sweet and gentle yet intense and menacing. It’s much more bluesy than the version recorded with John Coltrane that same year. Rollins proves to be more of a thematic improviser than Trane during this period. Art Taylor’s tasteful drumming compliments Miles’ ballad work perfectly. Collectors Items features Miles Davis on the move, experimenting with different groups featuring some of the greatest musicians in the world. This is the only recorded evidence of both of these Miles Davis bands, both with an ever blossoming Sonny Rollins. No collector should be without this glorious piece of history.